This badge is awarded for completing this curriculum in the Performance Certification System (PCS). 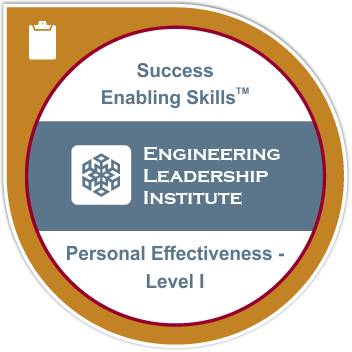 Personal Effectiveness Competencies are essential Success Enabling Skills that improve the Learner's ability to work and build effective relationships with others, enhances communication, and fuels Engineering career success. The owner of this badge receives 8.0 Professional Development Hours (PDH's). The pre-assessment provides the Learner with a view into their level of skill competency, identifies strengths and gaps, and prepares them for the curriculum coursework. The Learner earns 1.2 PDH's for the seven pre-assessments in this curriculum. The PCS contains robust, engaging, and entertaining courses based upon the curriculum in the Engineering Competency Model (ECM). This curriculum in the PCS consists of seven courses containing twenty-eight lessons. The Learner earns 5.6 PDH's for completing the lessons. The post-assessment measure gains in awareness, openness to growth, the importance of a forward-looking Learning and Development Orientation, and the advancement of the Learner’s skill development. The Learner earns 1.2 PDH's for taking the seven post-assessments. In 2015, the US Department of Labor and the American Association of Engineering Societies issued the ECM, a comprehensive competency model for the Engineering industry. The ECM provides a lifelong learning template for entry into, and to maintain ongoing proficiency in the Engineering profession.